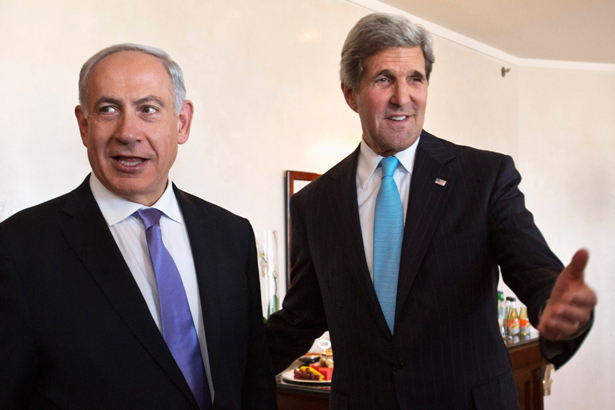 Iran, Israel and Palestine—Does Kerry Have A Plan? An Idea? Anything? He’s back for the sixth time in six months. John Kerry, secretary of state, is headed back to the Middle East again—not to Egypt, where the post-coup crisis is brewing, nor to discuss Syria especially, where there’s a civil war going on, but once again in pursuit of the elusive, Israel-Palestinian peace process. It’s his sixth visit in just six months on the job. It’s always a safe bet to plunk down your chips on the gamble that the peace process is going nowhere, but let’s watch this week’s events carefully. You’d have to think that either Kerry is crazy—a not unreasonable assumption, if it’s true that he advocated bombing Syrian airfields and runways—or that he genuinely believes that he’s getting somewhere. I think it’s very important to make clear to them that you won’t allow them to have this weapon and to demonstrate that by action. That is, you can also make clear that the nuclear option which is—the military option which is on the table is truly on the table. Uppermost in my mind—uppermost in my mind—uppermost in my mind is preventing the greatest terror of all. And that is that the radical Islamist regime in Iran gets the weapons of ultimate terror, nuclear weapons. So far, the Obama administration is ignoring Netanyahu on Iran, and tomorrow the P5+1 meets to get ready for the next round of talks with Iran, presumably after Rouhani takes office officially in August. Those talks, once they start, are likely to be long and protracted, and there doesn’t seem to be any likelihood that Obama will make concessions to Iran via the P5+1 in order to kickstart talks with Rouhani. Still, it’s a good sign that the United States is signaling that it’s willing to meet directly with Rouhani, and it’s a good sign that Kerry is focusing on Israel-Palestine. Senior Palestinian Authority figures are set to meet Sunday evening in order to discuss the negotiations. According to reports, they plan to stick with the three main Palestinian preconditions for resuming direct talks: a cessation by Israel of all construction in the settlements, agreement on the 1967 lines as a basis for talks, and a release of 104 long-term Palestinian prisoners held in Israeli jails since before the signing of the Oslo Accords in 1993. It isn’t likely that Netanyahu will meet the Palestinians even halfway on any of that, but Kerry must be thinking something. Mr. Kerry’s trip had appeared to take a dramatic turn on Saturday when he ripped up his itinerary and canceled a news conference and a trip that day to the United Arab Emirates so he could continue his meetings with Israeli and Palestinian leaders for another day. That spurred speculation in the Israeli news media that a summit meeting among Israeli, Palestinian and American officials might be hosted by Jordan. After four days of the most intense Middle East peace push in years, Secretary of State John Kerry left Israel on Sunday without securing a public commitment that the two sides would return to the negotiating table, though he insisted that “real progress” had been made and said that a resumption of talks “could be within reach.” In what has become a familiar refrain, Mr. Kerry promised to return to the region soon. Well, “soon” is now. He’s back. Let’s see what happens. Henry Siegman explains why Washington's policies on Israel have already doomed the peace talks.